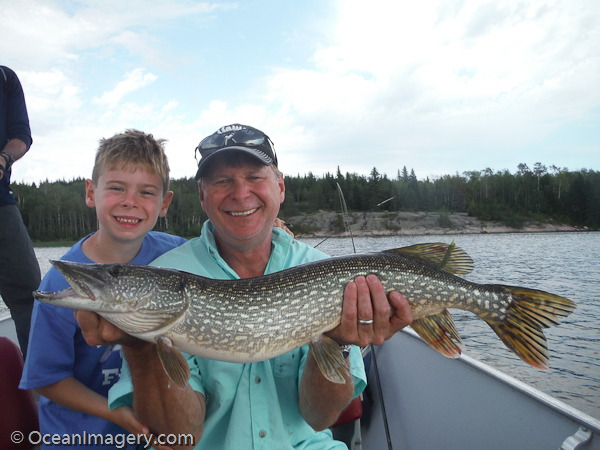 “Dylan congratulating me on another great catch” – Little Echo Lake, Manitoba, CA. Day two of our Manitoba fishing trip started with a wake up shout at 6:30 am along with a large carafe of coffee which I was the first to visit. Breakfast was served promptly at 7 am and after getting our fill we returned to our cabin to get ready for the long day of fishing ahead. We were told to meet our guides at the boats at 8 am and to bring anything that we thought we might need for the day, including beer because we wouldn’t return to the lodge until late afternoon. 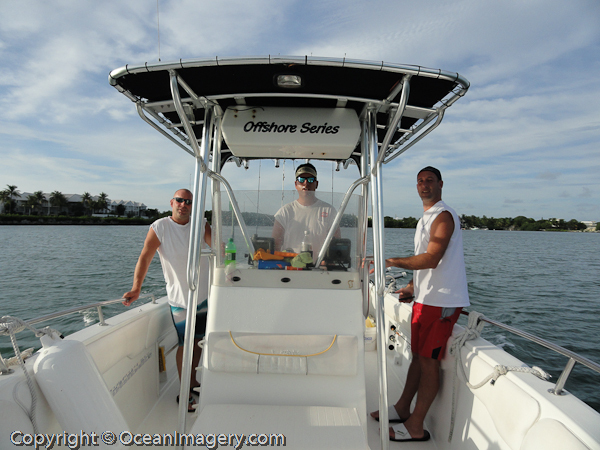 The weather was looking fantastic and we had high hopes of catching some monster fish. We meet our guide Troy at the boat just before 8 and after loading the fishing gear, coolers and cooking stuff for lunch we left the docks and headed to a deep rocky area just to the east of the lodge. 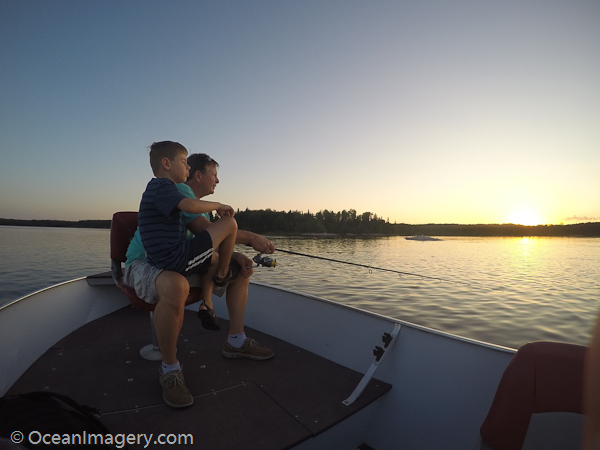 Troy explained that we would jig for Walleye first… once we had caught enough fish to fill our cooler for lunch then we could go fish for Pike which is more for sport. We hit a couple of Troy’s favorite spots over the next two hours and it didn’t take long, once we got the hang of jigging that is, to fill the cooler with Walleye. 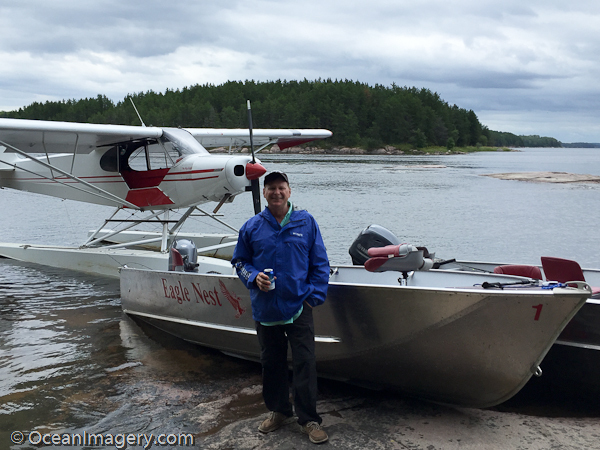 We then headed east to an area known as Jackfish Creek where we started trolling for Pike. 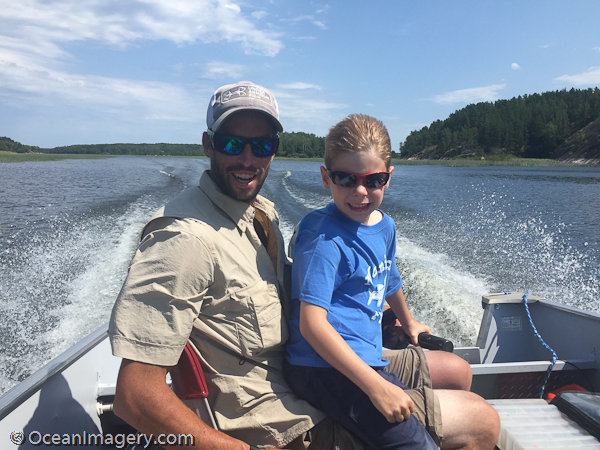 “Troy letting Dylan drive the boat after lunch” – Eagle Nest Lake, Manitoba, CA. 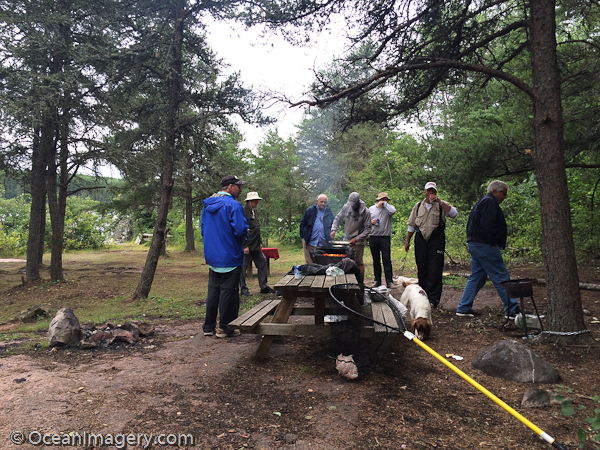 After an hour or so of catching small Pike we made our way to Strawberry Island where Troy and the other guides cooked us a fantastic fish & chips lunch over an open flame wood grill. Dylan’s not a fish eater yet, so Troy brought him two grilled cheese sandwiches which Troy cooked on the fire too. Dylan said they were the best he had ever had!! After a great lunch and a photo op for the family picture we were off to Echo Bay and Little Echo Lake in search of big fish. Dylan, Mike and I really started to bond with Troy and it wasn’t long before Dylan had talked Troy into letting him drive the boat! Yes, Dylan had himself a new big buddy! We spent the rest of the day landing some huge fish. 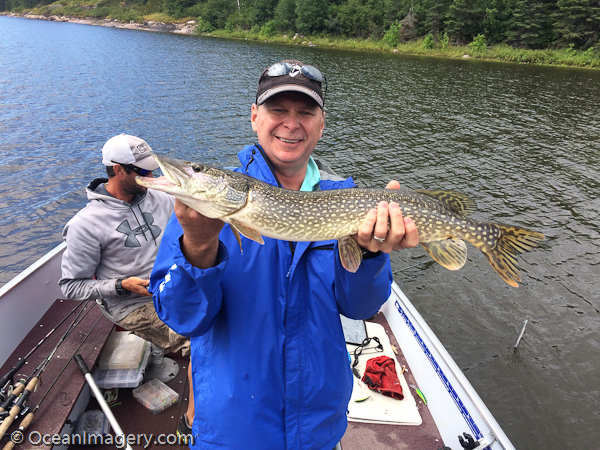 I had several 32″ to 33″ Pikes and Mike landed a beautiful 34″ Pike to tie Bruce’s’ record. Dylan surprised us all with his fishing skills as he started landing some nice Pikes as well. Troy said that Dylan was the youngest kid to ever fish with Eagle Nest Lodge and that he was doing a better job than a lot of adults. It was just shortly after that that Dylan caught and landed an 18″ Small Mouth Bass in Little Echo Lake! Dylan received a Manitoba Master Anglers Certificate for that catch. That’s My Boy!! 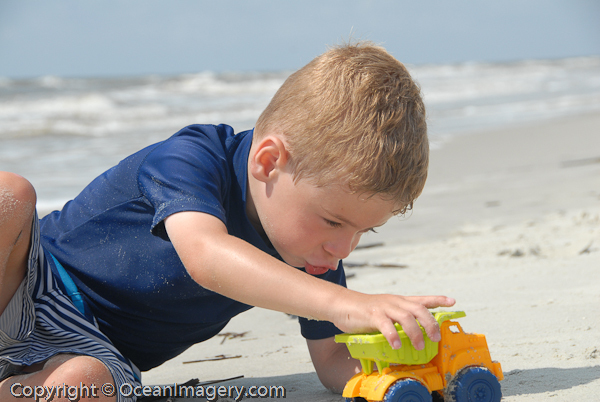 Last years trip to Fripp Island was so much fun that we decided to rent the same house and do it again this year! This year the fishing was better, but we caught more black tip sharks than expected. After Charlie pulled in a 3 plus footer, we decided to give the fishing a rest to keep from scaring away all the other vacationers. The golf was great and we managed to play several different courses in the area including Sanctuary, Legends at Parris Island and Ocean Point. Wow, what a great week!! There were so many great photos from the trip that I couldn’t put them all on the site, but here are the best of the best… enjoy! !